I've always had an interest in old computers - especially those systems contemporary to my youth, be it systems that I owned or wished I could have (or even just get access to). Back when I was at university, I amassed quite a collection of various systems, both small and large. Most of this had to be re-homed when I left the UK (Mum and Dad refused to store everything indefinitely), but a few systems I really cared about stayed. 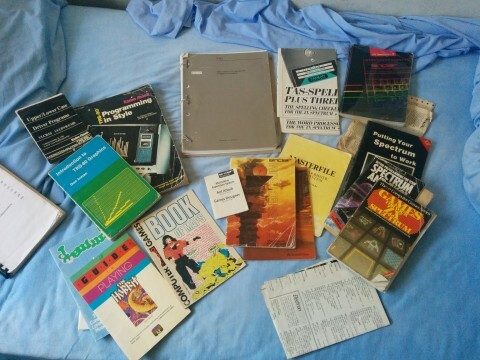 These included my ZX Spectrums (two 48k models and a +3), a TRS-80 Model 1, and my three Amigas (an A500 with A570 and A590, an A1200, and an A2000). After holding onto these for approaching 10 years, I finally bit the bullet and found a new home for the A500 (plus bits), the A2000 (along with all *those* bits), and the TRS-80 over at MicroMuseum.co.uk. 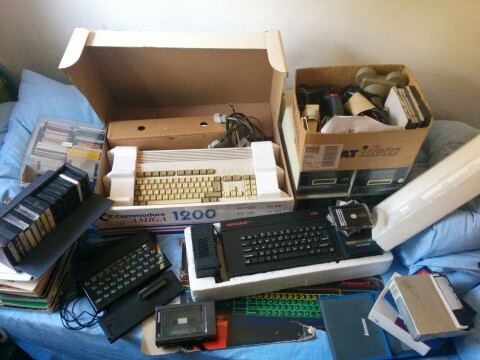 The A1200 and Spectrums I decided were small enough they could probably find their way home with me at some point. Well, the stars finally aligned back in September - we were making a trip over to visit Mum, who'd asked if I could clear this stuff out; I actually had the forethought to get a quote for seafreight of a large enough box to pack things; and most importantly, I had kinda-sorta-maybe received approval from my wife to let said box into the basement, on the proviso that I have a purge of some of the other "junk" I have down there first. When the time came, there was some sorting to be done, along with a little trimming to both fit everything in the box, and keep it under the 35kg maximum weight limit, but I was able to include most of what I'd set out to pack. I couldn't flat-pack the disk boxes, so they had to stay; and I removed the guts of the +3 PSU, as it's an old linear (and thus rather heavy) 240V unit, which should (in theory) be easily replaced with a modern switcher that will take 100-240V in and deliver the required +5V and +/-12V outputs with a bit more headroom than the original. I plan to do likewise with the A1200 PSU, but as that's already a switcher, it was light enough to just leave as-is for the purposes of packing. I ended up packing the floppies in a square cardboard box, double-bagged in plastic bags in batches of disks to at least try and keep the humidity reasonable. I was able to fit all the disks from the boxes on the right, which is all Amiga stuff, with disks that are labelled. Most of the box on the left didn't make it, but those are assorted unlabelled disks, which I suspect have a lot of PC stuff on. That's a job for another trip I suspect, along with finding the drive to read the 5.25" disks. Box of assorted unlabelled disks that didn't actually make it into the final box - who knows what's on these! Two 48k ZX Spectrums - neither of these is functional. I suspect some combination of capacitor, possibly transistor, and RAM replacement is necessary. 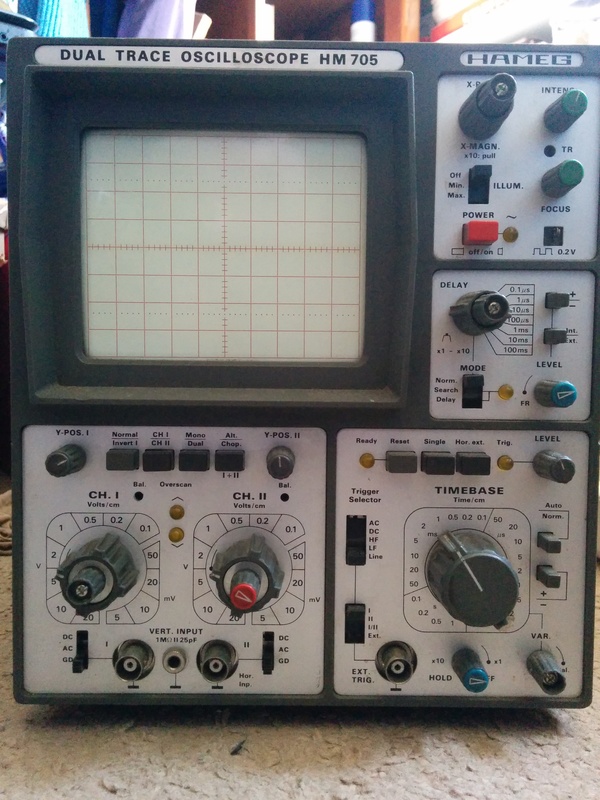 As well as all these goodies - I also managed to shoehorn my old Hameg scope into the box, along with plenty of padding around the knobs and connectors. It's built like a tank, so I'm hoping it makes it through the shipping process in one piece. It's already in need of a little TLC, but when I powered it on was mostly functional. Just some of the trim/cal knobs have lost their connection (a long rod) back to their respective pots.